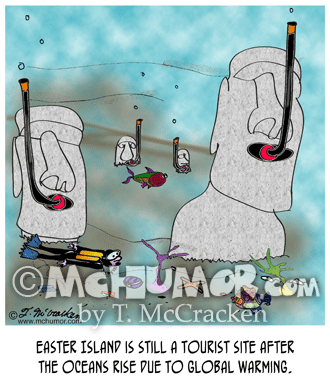 Ocean Cartoon 8843: "Easter Island is still a tourist site after the oceans rise due to global warming." 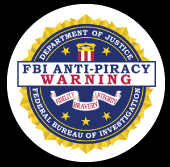 A scuba diver swims past the big headed statues which have snorkels. 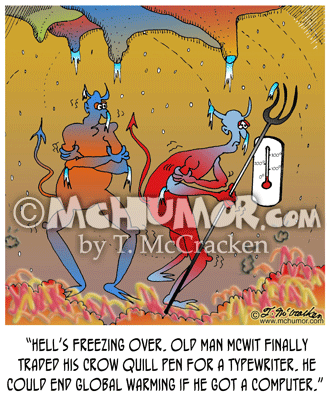 Penguin Cartoon 7004: "Adapting to global warming." 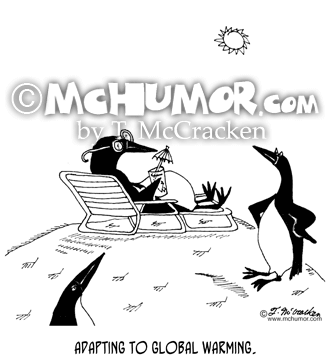 A penguin sunbathes and drinks a cocktail. 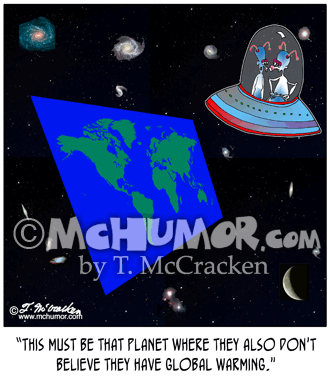 Astronomy Cartoon 9180: A space alien in a flying saucer looks at a flat map of the earth floating in space and says, "This must be that planet where they also don't believe they have Global Warming." 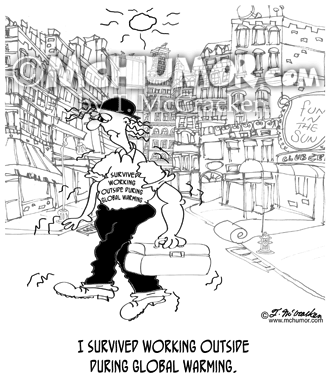 Global Warming 8543: A frazzled construction worker wears a shirt that says, "I survived working outside during Global Warming." 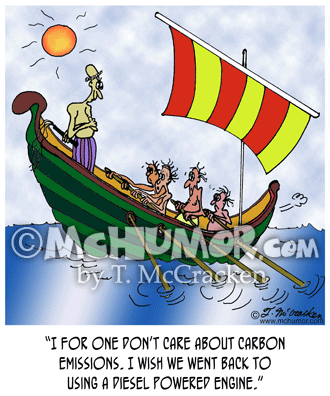 HVAC 5919: "Energy Conservation Be Damned. 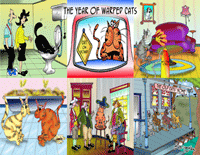 Fred constantly prepared for Global Warming and Nuclear Winter to happen at the same time." 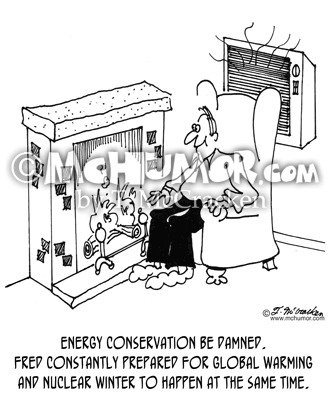 A man sits in front of a fireplace and an air conditioner that's turned on. 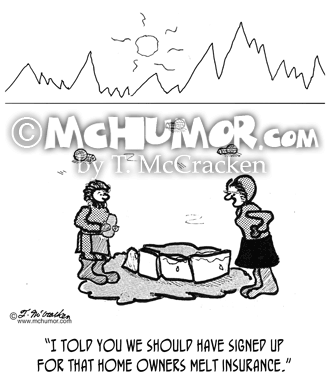 Eskimo Cartoon 2592: An Eskimo in front of a melting igloo says to her husband, "I told you we should have signed up for that home owners melt insurance." 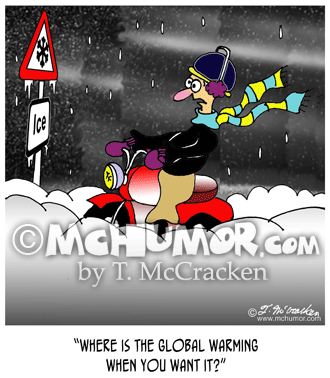 Scooter Cartoon 7427: Someone on a scooter freezing while driving through a snowstorm says, "Where is the global warming when you want it?" 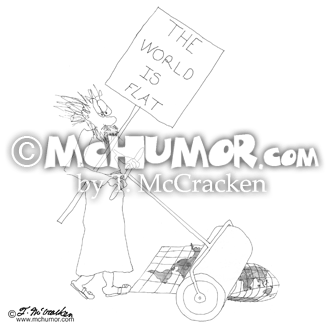 Flat Earth Cartoon 0093: A man with a placard that says: "The World is Flat" rolls over a globe with a hand pushed roller.